Slatwall Displays by GOGO Panels - Trade Show Displays, Trade Show Booths, and Retail Displays are freestanding trade show and retail walls that are extremely lightweight! Our slatwall displays are constructed from rugged ultralight ABS plastic. A kit can be fully assembled in under 30 minutes with NO TOOLS or additional materials required. All parts are waterproof, impact resistant, scratch resistant, and can be used indoors or outdoors. Each panel in this kit is 24 X 24(60cmX60cm exact) and weighs 4.8lbs. The panels have 6 slats on one side and are solid on the opposite side. The panels can all be installed with either the slatwall side or solid side facing out in thousands of different configurations. 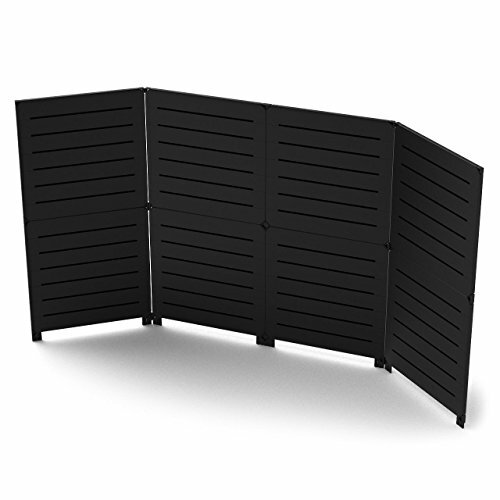 This slatwall system is designed to accommodate standard slatwall fixtures and accessories. Display Includes All panels and connectors required to configure the display shown. The display DOES NOT include Shelving, lighting, or flooring. Shipping cases, lighting, and Accessories can be purchased separately. If you have any questions about this product by GOGO Panels, contact us by completing and submitting the form below. If you are looking for a specif part number, please include it with your message.